Background: Mitochondrial carriers are integral proteins of the mitochondrial inner membrane that transport metabolites, nucleotides, and co-factors between the cytosol and the mitochondria (1). The calcium-binding mitochondrial carrier protein ARALAR (SLC25A12, AGC1) is an aspartate-glutamate exchange protein responsible for transporting mitochondrial aspartate across the mitochondrial inner membrane in exchange for cytosolic glutamate (2,3). 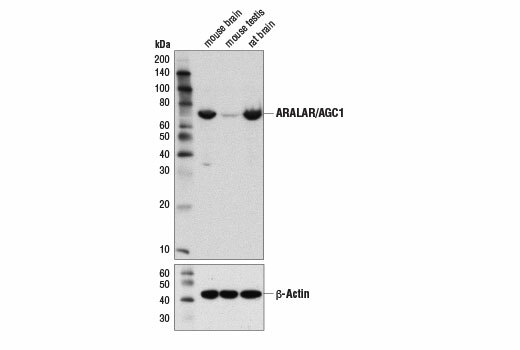 ARALAR and other proteins of the aspartate-glutamate carrier (AGC) group are required for the transfer of mitochondrial aspartate to the cytosol, a key step in urea synthesis (4). 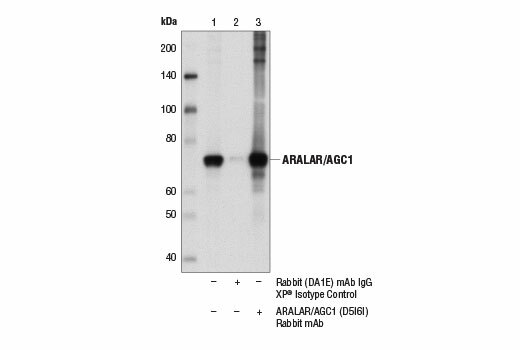 Research studies using ARALAR-knockout mice indicate that ARALAR plays an important role in proper CNS myelination. Mice lacking ARALAR suffer from hypomyelination as a result of a lack of oligodendrocyte maturation caused by decreased brain N-acetylaspartate levels (5). Mutation of the corresponding SLC25A12 gene can result in global cerebral hypomyelination and severe psychomotor retardation, caused by deficient ARALAR activity and limited mitochondrial aspartate efflux (6). Background: Glutamate is the major excitatory neurotransmitter in the mammalian central nervous system. During neurotransmission, glutamate is released from vesicles of the pre-synaptic cell, and glutamate receptors (e.g. NMDA Receptor, AMPA Receptor) bind glutamate for activation at the opposing post-synaptic cell. Excitatory amino acid transporters (EAATs) regulate and maintain extracellular glutamate concentrations below excitotoxic levels. In addition, glutamate transporters may limit the duration of synaptic excitation by an electrogenic process in which the transmitter is cotransported with three sodium ions and one proton, followed by countertransport of a potassium ion. 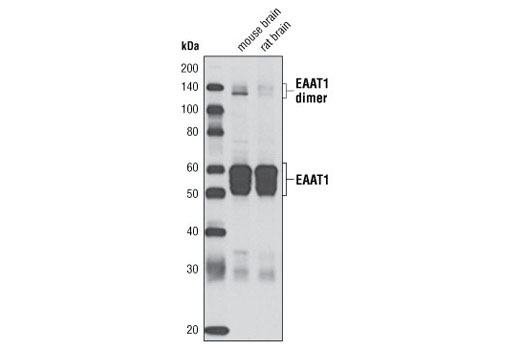 Five EAATs (EAAT1-5) are characterized: EAAT2 (GLT-1) is primarily expressed in astrocytes but is also expressed in neurons of the retina and during fetal development (1). 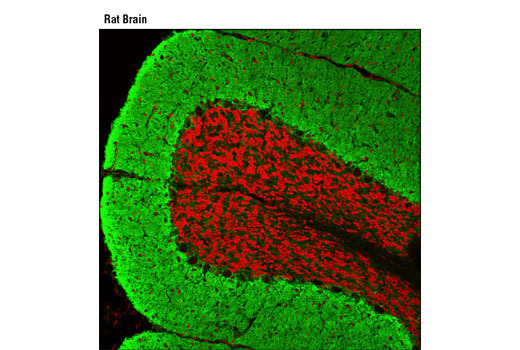 Homozygous EAAT2 knockout mice have spontaneous, lethal seizures and an increased predisposition to acute cortical injury (2). 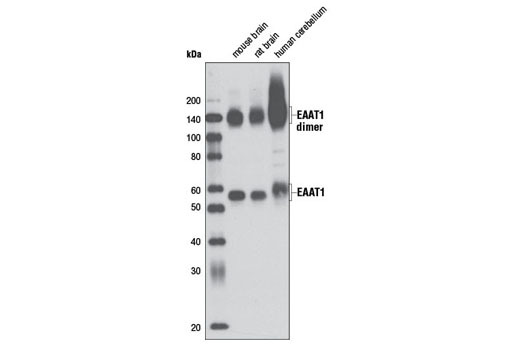 PKC phosphorylates Ser113 of EAAT2 and coincides with glutamate transport (3).